The records of the Judenrat of the Lodz ghetto are an extremely valuable database, consisting of the movements and fate of the 200,000 inhabitants of the Lodz ghetto from February 1940 to August 1944. This five-volume work was published jointly by the Organization of Former Residents of Lodz in Israel (OFRLI) and Yad Vashem as Lodz-Names: List of the Ghetto Inhabitants, 1940-1944, in 1994 (other titles: Lodz - shemot: reshimat toshvei ha-geto, 1940-1944; Shemot Lodz). It is at once a memorial to the victims of Nazi brutality and a genealogical treasure. Not only was the Lodz ghetto the longest existing ghetto in Poland, but the surviving records are the most detailed of any Polish ghetto. The five volumes were published in the following format: four original volumes plus the supplementary volume. There is also a one-page addendum of additional names. One can not overemphasize the importance and usefulness of these records. On my first trip to Yad Vashem, I asked about Lodz records and was directed to these volumes in the library. Within minutes, I found the names, birth, deportation dates or death dates of my grandmother, aunts, uncles, cousins, my father and his first wife. Most importantly, there, in black and white, was the name and birth date of the child my father lost -- information I always thought was irretrievable. (9) Notes: This section may include previous address* or town**, date of death or deportation (and possibly the transport number). **Many towns were renamed by the Germans in 1939-1940. Equivalent Polish town names may be found in Lodz Ghetto Deportations and Statistics, Table C.
In the ninth column, Notes, German or Polish abbreviations are used to denote the movements or fate of the individual. AG or A.G. + date Change of registration to new address, or deportation (to Chelmno); AG may be used as an abbreviation of either "Abgang" or "Ausgang"
In August 1944, the Nazis dissolved the Judenrat and the ghetto was liquidated. Thus, no entries were made about the fate of those deported to Auschwitz in the ghetto's last days. The absence of such information is a clue in itself, however, especially if there is evidence the individual was still alive in 1944. The Talman family below is such an example. TALMAN, Joel Icek [m], b. 1886, of Lowenstadt [Brzeziny]; occupation: "fuhrman" [driver]; ghetto address was Hanseaten 12; "Gest." [died] 23 March 1943 in the ghetto. TALMAN, Chana [nee' TOPOLOWICZ], b. 1892, of Lowenstadt; occupation: "hausfrau" [housewife]; "ABG" [moved] to ghetto address Hanseaten 12 on 7 April 1944 [no further information on her fate]. TALMAN, Marjem [f], b. 1913, of Lowenstadt; occupation: "schneider" [cutter or tailor]; "ABG" [moved] to ghetto address Hanseaten 12 on 7 April 1944 [no further information on her fate]. TALMAN, Elka [f], b. 1926, of Lowenstadt; occupation: "schneider" [cutter or tailor]; "ABG" [moved] to ghetto address Hanseaten 12 on 7 April 1944 [no further information on her fate]. By further grouping all eleven individuals with the surname TALMAN by ghetto address one may reasonably assume there were three distinct families with this surname in the ghetto. A copy of the ghetto list is maintained in the office of the co-publisher of the book: Organization of Former Residents of Lodz in Israel (OFRLI), 158 Dizengoff Street, Tel Aviv 63461, Israel. Lodz-Names: List of the Ghetto Inhabitants, 1940-1944 and the records of the Judenrat of the Lodz ghetto may be available in additional libraries or in the possession of organizations unknown at the present time. Even though the records contained in Lodz-Names: List of the Ghetto Inhabitants, 1940-1944, are very extensive, they do not contain a complete list of every Jew incarcerated in the Lodz ghetto. The extant records of the new cemetery, from 1892 to August 1944, are an excellent source of genealogical information. The Lodz Chevra Kadisha continued to record burials of those who died in the ghetto (some 43,000 to 60,000 victims), right up until the liquidation of the ghetto in August, 1944. 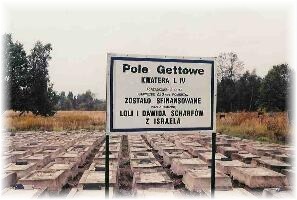 Most of these victims were buried in the Pole Gettowa (or Ghetto Field) in the cemetery. Some ghetto victims were buried in other parts of the cemetery, or in unknown locations. Fortunately, the Chevra Kadisha records have survived. In some instances, the cemetery records can supplement information found in the ghetto list, Lodz-Names: List of Ghetto Inhabitants, 1940-1944, by supplying the father's name of those listed in the ghetto records and buried in the cemetery. Some ghetto victims whose names are not found at all in Lodz-Names: List of Ghetto Inhabitants, 1940-1944 are found in the cemetery records. This is evidence that the published ghetto records are an incomplete list of all Jews incarcerated in the ghetto. Limitations of the cemetery records are the lack of maiden names of married women and, occasionally, missing father's names. These valuable records are held by two entities: the Jewish community of Lodz and the Organization of Former Residents of Lodz in Israel. The best way to obtain information from these entities is an on-site visit, either by yourself or your representative. Be prepared to offer a donation along with your request. For more information, see The New Cemetery in Lodz. See this site for information on additional records of the Lodz ghetto contained in the Lodz Archives. Transport lists of Jews deported to the Lodz ghetto from other countries may contain names of individuals not listed in Lodz-Names: List of Ghetto Inhabitants, 1940-1944.